ROCHESTER, N.Y., Jan. 4, 2018 /PRNewswire/ -- Vuzix® Corporation -- Vuzix® Corporation (VUZI), ("Vuzix" or, the "Company"), a leading supplier of Smart Glasses and Augmented Reality (AR) technologies for the consumer and enterprise markets, is pleased to announce that the Company will showcase its next-generation wearable technology smart glasses and augmented reality products at CES 2018, including the Vuzix Blade™, which was awarded four International CES Innovation 2018 awards. The Company's products will be displayed at the Las Vegas Convention Center (LVCC), Central Hall Booth #17147, from January 9 to 12, 2018. The Vuzix Blade™ leverages the Company's intellectual property patent portfolio, which consists of over 100 patents and patents pending and its leadership position in the area of optics, head mounted displays and smart glasses, which has allowed Vuzix to bring to market the world's smallest and most sleek pair of AR smart glasses ever developed. Vuzix will demonstrate cutting edge user capabilities that will highlight the overall versatility and utility of the award winning Vuzix Blade Smart Glasses that was designed for both enterprise and prosumer users. 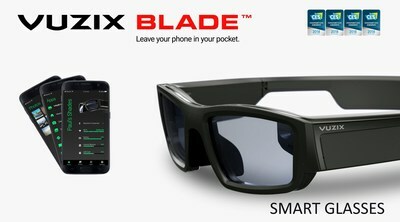 Vuzix Blade represents the first pair of smart glasses that allow individuals to leave their phone in their pocket while presenting location aware content connected through the user's phone. Retail and enterprise workers can use the Vuzix Blade to scan barcodes, receive their work instructions, take pictures and use 2-way video streaming to leverage the power "see-what-I-see." Vuzix will demonstrate its VUZIX Basics™ Video solution on the M300 Smart Glasses, a remote support and telepresence software as a service (SaaS) subscription offering that is available now for purchase on the Vuzix M300 Smart Glasses. Texas Instruments (TI) will demonstrate the Vuzix Blade and the Vuzix waveguide and cobra developer kits at the TI booth at CES for select third party developers. The Vuzix Blade features TI's DLP Pico display technology alongside Vuzix' unique waveguide optics technology and custom Cobra II display engines. Powershelf will have on display its "Powershelf Stock to Sight and Pick-to-Sight, powered by Vuzix" AR glasses at Booth #10948 at CES. "We are excited to unveil Vuzix Blade at CES to existing and new partners, as well as members of the media and investors," said Paul Travers, President and Chief Executive Officer of Vuzix. "Vuzix Blade are the most compact and sleek AR-enabled smart glasses available today. The Blade enables a broad range of information display and computing in a pair of glasses that people would actually enjoy wearing. Either at work or at leisure, the Blade is the perfect smartphone companion, providing hands-free access to all the critical alerts the phone generates. More importantly, it is the only AR-enabled pair of smart glasses that work right out of the box, without the need for programming - just connect to your device, customize your setting and go." In addition, the Company will have several partners exhibiting their Vuzix smart glasses solutions. Vuzix will also be attending the Pepcom CES 2018 Digital Experience press event on the evening of January 8, 2018, at the Mirage Hotel in Las Vegas. To schedule a meeting with Vuzix representatives during CES 2018, please contact our PR representative Jiten Dadlani at jitendadlani@maxborgesagency.com or Matt Margolis at matt_margolis@vuzix.com. To learn more about CES, please click here. To learn more about Pepcom, please click this link. Vuzix is a leading supplier of Smart-Glasses and Augmented Reality (AR) technologies and products for the consumer and enterprise markets. The Company's products include personal display and wearable computing devices that offer users a portable high-quality viewing experience, provide solutions for mobility, wearable displays and virtual and augmented reality. Vuzix holds 59 patents and 42 additional patents pending and numerous IP licenses in the Video Eyewear field. The Company has won Consumer Electronics Show (or CES) awards for innovation for the years 2005 to 2018 and several wireless technology innovation awards among others. Founded in 1997, Vuzix is a public company (NASDAQ: VUZI) with offices in Rochester, NY, Oxford, UK and Tokyo, Japan. Certain statements contained in this news release are "forward-looking statements" within the meaning of the Securities Litigation Reform Act of 1995 and applicable Canadian securities laws. Forward looking statements contained in this release relate to new products and technology demonstrations at CES, the advancements of Vuzix products, and among other things the Company's leadership in the Smart Glasses and AR display industry. They are generally identified by words such as "believes," "may," "expects," "anticipates," "should" and similar expressions. Readers should not place undue reliance on such forward-looking statements, which are based upon the Company's beliefs and assumptions as of the date of this release. The Company's actual results could differ materially due to risk factors and other items described in more detail in the "Risk Factors" section of the Company's Annual Reports and MD&A filed with the United States Securities and Exchange Commission and applicable Canadian securities regulators (copies of which may be obtained at www.sedar.com or www.sec.gov). Subsequent events and developments may cause these forward-looking statements to change. The Company specifically disclaims any obligation or intention to update or revise these forward-looking statements as a result of changed events or circumstances that occur after the date of this release, except as required by applicable law.